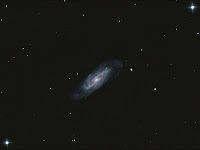 After 2683 I moved on to spiral galaxy NGC 3198 which is in Ursa Major. This is a fairly faint object but the ongoing clear sky allowed me to get a good number of subs for it. The bright star just to the right of the galaxy is a very close double. The two brighter stars in diagonal corners form a pleasing symmetry. Details: 10" f4.3 Newt. 14x 10 minute exposures @ iso1600 with CLS in DSS, CS2 & XAT.